Moving time: 3 hr 46 min. Wind: Light, variable winds - not a factor. Weather: 50°F (10°C) in the morning; got up to 87°F (31°C) by end of ride at 4:00pm. Clear skies. My bicycle completely fell apart today. My rear tire just about completely gave out on me today. I've worn the rubber completely off the tire and am left with the fabric casing on about half the tread. Shortly after I noticed this my rear derailleur cable broke, leaving me stranded in my highest cassette cog. I limped into Eugene with three high gears and a shredded rear tire. My spare derailleur cable wasn't long enough (I overlooked this during my ride preparation) and my spare tire is already worn pretty bad. Luckily the ride was downhill along the McKenzie River and there are lots of bike shops in town. I bought a few cables and a tire in town and made my repairs in the evening. The picture at the top of the page shows me sizing up my cable situation. 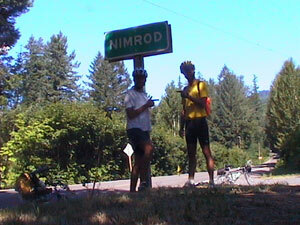 Joe and I rode through Nimrod, Oregon today. It's a funny town with very few residents. 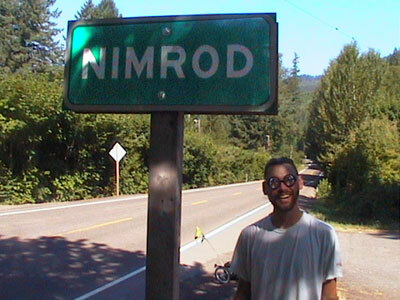 We felt it appropriate to take some pictures of ourselves with the sign since only a real nimrod would get on their bike and ride across the country. Joe lent me his funny coke bottle glasses to wear for my picture. 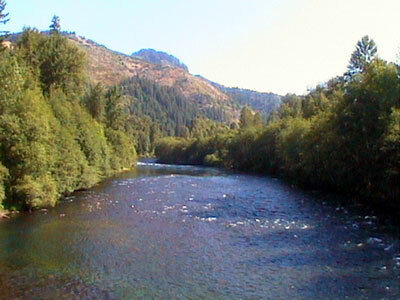 The ride along the McKenzie River was very peaceful but the traffic was a little heavy leading into Sprinfield and Eugene, Oregon. 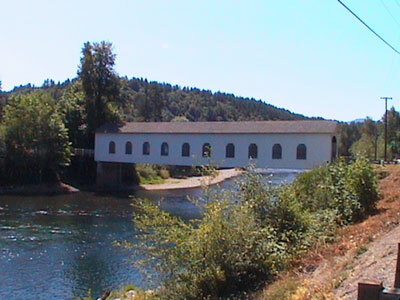 I passed this covered bridge along the road and it looked very quaint. It's a well maintained, wooden deck bridge with glass windows along the sides. 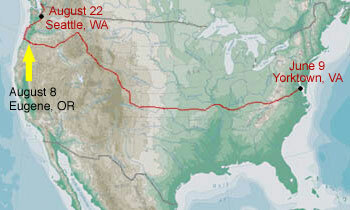 Eugene is a very bicycle friendly city with lots of bike trails and routes. It reminded me much of Missoula, Montana. I went to the Bike Friday showroom/factory today in Eugene. They had a Schwalbe touring tire that will work very well on the rear wheel for the rest of the journey and more. I talked with Mike Kelly, one of their sales consultants, about their bikes and all the options they offer. I have considered touring in Europe and their bikes that fit in suitcases seem like a perfect solution. I'll have to consider it as my next journey. If I cross Europe in a future summer then I'll just be left with Asia to complete my round-the-globe cycling accomplishment. Perhaps I won't... Who knows? 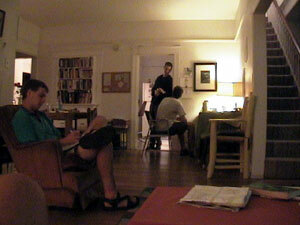 The hostel is a hopping place tonight. An eclectic mix of people of all ages are staying here tonight. Some are here for a week or more but most are just passing through town on the way to their next destination. Some are on vacation for a week, others for a summer, while some are on a life-long vacation. Youth hostels are very unique places that offer great friendship and hospitality. I can't wait to see what Seattle's is like.